With the new KSP loading, the Poodle suddenly became a hot topic, due to the redesign. This led me to wonder a bit on the actual use of the Poodle. When I design rockets, I almost never come up with a design where I would prefer the Poodle over the Terrier, which get a lot of use due to its light weight. If I need more power, I usually need so much more that I go for a Skipper. So it seems like I am missing something, please show or explain actual craft specs where you looked at the Poodle and thought: This is perfect. So it seems like I am missing something, please show or explain actual craft specs where you looked at the Poodle and thought: This is perfect. Over 1000 Poodle use cases all neatly on one site to peruse, with downloadable craft files. If I'm using it, it's generally the upper stage of a larger rocket, or a larger lander. The way I see it, it exists so you don't have to cluster 3 or 4 Terriers together if you don't want to. If you have the DLC with the Wolfhound, then it's significantly less useful; but it's still a good all around vacuum engine. For 2.5m CSM? Basically any 2.5m stage that does not require nuclear engine. The Poodle has relatifly high thrust and the highest vacuum isp. It's a good all around engine for all non-atmo situations. The suggested 2.5m CSM modules are actually just what I am speaking of, because we all have build a craft like that. When I run the numbers, the Terrier comes out with a higher total dV due to its light weight, even when I haul a LEM. And 60 kN is abundant trust to handle every orbital maneuver I could dream of executing in a visit-a-moon scenario. The ISRU lander could very well be the actual case for which I would use it, but I tend to have the drills and converters in installations, or on much larger autonomous refuelling tankers. The link I gave you shows 1075 actual craft specs made by people that looked at the Poodle and thought: This is perfect. They not only used the Poodle, they felt like the result was worth showing off and sharing. I figured that by looking through them you could determine what you may be missing. If none of those craft fulfill any of the use cases you can dream of, then in your context you are not missing anything, which would also be an answer. I do notice you put the lower bound on acceptable solutions on a Terrier, and then add an upper bound which is also a Terrier. If those are the bounds, then we can wrap up this exchange: you're not missing anything - the Poodle is indeed not very good at being a Terrier. Because, well, it is not a Terrier. Oh my GOD! That is absolutely insane! I am so far beyond impressed with that guy's ships, he even did the bloody Aurora from Subnautica, incredible artwork. I have nothing to contribute to the topic at hand (I have roughly 0 use cases for the poodle) but I just had to comment on that when I saw it. It's for pushing around heavy stuff in space. Not even 2.5 m stuff, unless they're substantially heavier than usual. 3.75 m and above, works like a charm. Umm wolfhound destroys poodle. Wolfhound has higher thrust, higher twr, and higher ISP. There are only a couple reasons you might choose poodle over Wolfhound. 1. The wolfhound is vertically too large for your lander design. 2. You just like the poodle. But in general, the poodle has been put out like Old Yeller. Terrier, Wolfhound, Nerva, and Ion are the vacuum engines of choice. While we may own the DLC, a lot of people don't. Which is why we haven't been discussing the Wolfhound, the same way we wouldn't discuss a mod engine. For those who don't have Making History, the Poodle is a great engine. 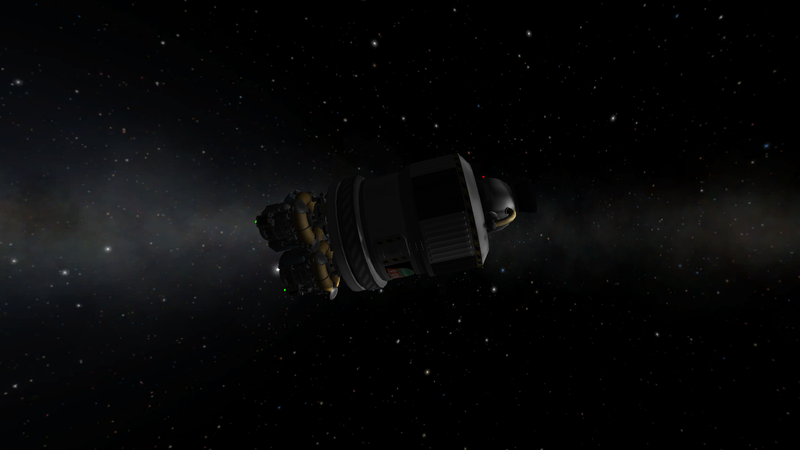 The NERV is so heavy it isn't really worth taking unless you are going past Duna, and is poor for landers due to aforementioned weight and undesirable form. Ions are great, but not so much for larger craft. You could cluster Terriers, but a single Poodle would be better in that case. You could say the Poodle is the "non-DLC owner's Wolfhound." Unless they specify they don't have the full version of the game, I just assume they do. That's kinda the norm in gaming to assume expansions are owned unless specified. Maybe that's different in the KSP community? The DLC hardly has anything you "need" to have, it's very optional. I'd say the only reason to buy it for is the mission editor really, if you aren't interested in making/playing custom missions, I doubt you'd pick it up. 3. You don't have Making History. 4. You think the Wolfhound is tantamount to cheating. For me, though, 2, 3, and 4 don't apply. 1 is enough. Poodle ruled until dethroned by Wolfhound. I used it for all large interplanetary craft and large vacuum landers, as well as insertion stages in heavy multi-stage lifters. It's funny, that. I'm kind of fixated on keeping things balanced... but I love the Wolfhound. It's made possible some designs that I otherwise wouldn't have attempted, like medium-heavy single-engine atmospheric craft for Duna. It is so good that it feels almost like cheating, but I'm still enjoying it, like, a lot. I'd be a bit sad if they rebalanced it to saner numbers. Hm in my circles the assumption is you have the base game and any free expansions, and anything paid you should state you have it. "I play Cities: Skylines" means you spent $20 on a game, not $190. Wolfhound is an Expansion Part. Thus not the same as as a stock engine. It's also relatively op compared to stock chemical engines, so another reason to not directly count it into the equasion. Liking the poodle isn't really the case. It's just useful for the niche which it fills. IT's the dedicated 2.5m vacuum engine and for being a high ISP engine, it actually has a rather high thrust as well. Additionally, it's main usage, as stated many times by how the devs have seen their usage. It's also very useful for landers (unlike the Rhino or Nerva). Also, The MH expansion is also rather niche in what it does (compared to Cities Skylines Expansions, which are often really huge). So MH isn't that tempting to get for most people. I'm starting to see that. It completely blows my mind. I couldn't imagine buying a game without all its parts haha. I'm the kind in steam that just clicks to buy the bundle with all the DLC included XD. Prior to Making History, I would traditionally use the Poodle for larger interplanetary vehicles. I treated it like a scaled-up Terrier, I would use it in every situation I might use a Terrier for, just when everything had to be bigger. I supposed I could have technically just added a whole bunch of Terriers to a larger vessel and it might have gotten marginally more efficiency out of it, but if I needed that kind of absolute efficiency I would be using NERVs instead, and frankly a small number of big engines looks (and performs) much better than a huge cluster of smaller ones. 1) People build larger landers than I do, and travel more outside the Kerbin SOI. I should get more to other planets where I need that kind of power. 2) People build smaller interplanetary craft, so the very high mass of Nervs make them a less appealing choice. I ought to run more numbers when I build interplanetary to see if the Poodle is competitive. 3) I am not the only one who is a bit uneasy about the Wolfhound. The only non stock engine I use is NecroBones' three-Nervs-in-one-part, as I feel many mod engines might be badly balanced. Wolfhound is a stock engine. It's part of the Making History Expansion released by the devs. It's balance is questionable, but it's still stock. Wolfhound is pretty broken. So much so that I used it on basically everything when it was first released, and now I must abstain from its use entirely as it is simply too good. Just in general I don’t know how to feel about the making history parts in general. Modded parts have always had a tendency to just make the game easier, so often I end up installing more mods (ie. OPM) to make the game harder. The making history parts are basically a set of good parts that are sinmilar to the design philosophy for modded parts: fill in gaps in the stock part repository. However, those gaps are intentional (probably), and do serve to make the stock game a bit more interesting. Anyway this is not quite related to the poodle so, in defense of our canine friend, it is my absolute default second stage engine, as it fits the role perfectly. It’s only problem for me was it’s sub par looks, but the almighty 1.6 update promisiesnto fix that, and I’m sure that there is much consensus on this matter. The making history parts are basically a set of good parts that are sinmilar to the design philosophy for modded parts: fill in gaps in the stock part repository. However, those gaps are intentional (probably), and do serve to make the stock game a bit more interesting. I would argue that if the put parts into stock (even as a paid expansion stock) then the gaps were not intentional, or at least not intentional anymore. That having been said, new parts tend to cause balance issues when contrasted with old parts, which I would argue is probably not intentional. Try doing that with a wolf hound.